Tuesday, March 07, 2006 by: Leigh Erin Connealy, M.D. Eating a wide variety of fresh, wholesome foods packed with powerful vitamins and minerals is the first step to ensuring a strong immune system. Vitamins A, B6, C and E and the minerals zinc, iron, copper and selenium are critical for maintaining strength and immunity. Make sure that your diet consists of a rainbow of fruits and vegetables to ensure that you are getting all of the necessary nutrients. Supplementing your diet with a daily multivitamin will fill the gaps where your diet falls short and should be an essential part of your health regime. During cold and flu season, increase your dosage of vitamin C for added virus fighting benefits. Should you still become sick, studies have shown that the powerful antioxidants in vitamin C can reduce both the symptoms and duration of the flu. Certain foods can give you an extra boost and should be factored into your regular eating habits. Garlic is known for its antibacterial, antiviral and antifungal properties and can prevent infections from taking hold and spreading. 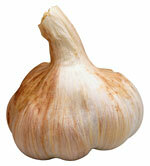 A daily serving of two raw garlic cloves will provide you with the bulbous herb's healthy benefits. Tip: To avoid offensive garlic breath, cut the cloves into smaller pieces and then swallow them with water or herbal tea. Follow with a sprig of parsley. According to Dr. J. Anthony Morris, the former Chief Vaccine Control Officer at the FDA, "There is no evidence that any influenza vaccine, thus far developed, is effective in preventing or mitigating any attack of influenza." When you also consider the toxic mixture of chemicals found in the flu vaccine, the decision becomes a no-brainer. Among the vaccine’s ingredients are such toxins as ethylene glycol (a.k.a. antifreeze), formaldehyde (a known carcinogen), aluminum (linked to Alzheimer’s disease and known to produce cancer in mice) and thimerosol (a form of mercury, the most toxic of all heavy metals). Thimerosol has had so much scrutiny in the past decade that it has been banned in all childhood vaccinations in the United States, yet it still remains in the influenza vaccine today. Dr. Connealy, M.D., M.P.H. began private practice in 1986. In 1992, she founded South Coast Medical Center for New Medicine, where she serves as Medical Director. Her practice is firmly based in the belief that strictly treating health problems with medications does not find the root cause of the illness. Dr. Connealy writes monthly columns for Coast and OC Health magazines, and is a biweekly guest on Frank Jordan's "Healthy" radio show. She routinely lectures and educates the public on health issues.